A study carried out in the framework of the project ‘QUALITY of life in a changing Europe’ aimed to review gender differences in quality of work and life. The survey findings show that men are in more privileged positions at work, while women are more committed to the company. Gender differences are registered concerning most of the study’s indicators of work quality, including autonomy, job satisfaction, supervisor support, job security and work–life balance. The project ‘QUALITY of life in a changing Europe’ (2006–2009) has been conducted in eight countries – Bulgaria, Finland, Germany, Hungary, the Netherlands, Portugal, Sweden and the UK – under the European Community Sixth Framework Programme. Based on quantitative and qualitative research, the project aimed to examine how European citizens living in different welfare state regimes evaluate the quality of their lives and workplaces. The surveys conducted within the project put special focus on the gender dimension of the quality of work and life. The study findings are summarised in the reports ‘Differences between men and women in work quality’ and ‘Differences between men and women in quality of life (224Kb PDF)’. The survey instruments included a web-based questionnaire applied in four establishments in each country in four fields of economic activity: retail, telecommunications, financial intermediation and hospitals. The study also involved in-depth interviews in one of the establishments in each country, as well as analysis of Eurostat data on employment, gender differences and working conditions. The survey findings are not representative of the country, the sector or even the company, as people volunteered to participate in the survey. Measurement of the subjective perceptions of different aspects of quality of work and life is based on scales and sets of indicators constructed by the QUALITY team. The respondents to the Bulgarian survey comprised 767 employees, 579 of whom were women. The women taking part tended to be older than the men, with a sample mean age of 39.6 years compared with 36.5 years for men. About 60% of both the men and women had post-secondary education. According to the survey and as shown in Figure 1, some 18% of men – compared with just 10% of women – are supervisors, while 39% of men receive training paid by the employer, compared with 36% of women. 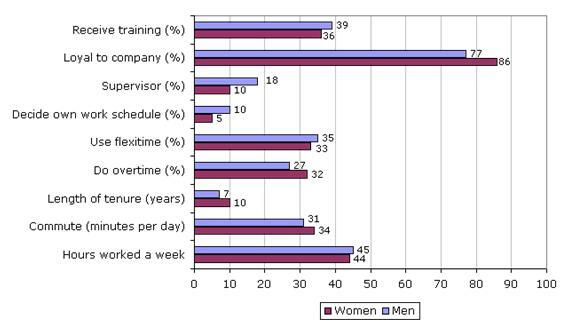 Men also enjoy more opportunities to use flexible working time (35%) and decide their own work schedules (10%). Women have spent a longer time in the companies – their job tenure is 10 years on average while that of men is seven years (Figure 1). They are more loyal to the organisation, that is, they are less likely to have looked for jobs outside the company in the past six months. The women surveyed are more likely to work overtime (32% compared with 27% of men), but make less use than men of flexible work options such as flexitime (33%) and deciding their own work schedule (5%). The survey findings suggest that small, but identifiable, gender differences exist in quality of work perceptions. 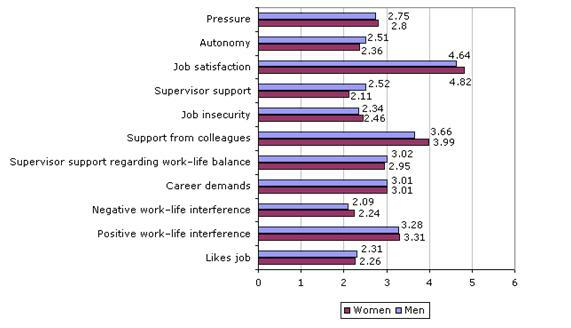 As Figure 2 shows, although men and women tend to equally experience pressure at work and high career demands, men enjoy greater autonomy, more support from their supervisor and like their job more. Women are more likely to experience job insecurity, lack of autonomy and less supervisor support, including in relation to work-life balance. However, they enjoy greater support from their colleagues and claim that their work has a positive impact on their lives outside the workplace (positive work–life interference). Although women tend to be in a disadvantaged position at work, they are more likely to experience job satisfaction in terms of the pride and pleasure that people find in work. The value of this indicator for women is 4.82 while it is 4.64 for men. Note: The scale runs from a low of one to a high of seven. Although they work in paid employment just one hour less than men a week (see Figure 1), women spend twice as many hours on housework (15.1 hours), thus spending 59.2 hours a week doing paid and unpaid work. This total is 52.4 hours for men. Significant gender differences arise both in the length and use of leisure time. Whereas 54% of men go out with their partner and 41% with friends, the same is true for 42% and 23% of women respectively. However, the gender differences regarding satisfaction with different areas of life are negligible (see table). Note: The results are based on a scale of one to five, where one means very satisfied. The life scale runs from one to seven, with seven being very satisfied. The survey provides interesting insights into the gender differences in quality of work and life under different welfare state regimes. It contributes to research in the field by developing an online cross-national social quality instrument. This gives European citizens an opportunity to evaluate the social quality of their workplaces and includes indicative information about components of quality of work such as job demands, autonomy, stress, job satisfaction, fairness of pay and work–life balance. The instrument also shows how the respondent is located in relation to other European workers.